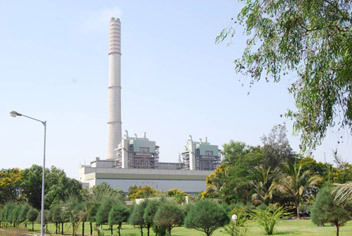 Dahanu Thermal Power Station (DTPS) is a 500 megawatt (MW) coal power plant located in Maharashtra, India. The power plant is owned by it is operated by Reliance Infrastructure Limited, which until 2008 was known as Reliance Energy and before that as Bombay Suburban Electric Supply (BSES) . The plant is the largest power generating facility of Reliance Energy Limited; it consists of two 250 MW units, both commissioned in 1995. The first proposals to set up a coal fired thermal power plant in Dahanu date back to 1986; they have always met with fierce opposition from local people and orchard owners. Sensing the possible adverse effects on the region, residents and farmers got together to campaign against the setting up of the plant in Dahanu. Several state and central government committees were appointed to find out the viability of Dahanu as a potential site for a fossil fuel-based plant. All these committees gave a negative report on Dahanu as a proposed site for the power plant. The committee observed that the possible plant will affect the livelihood of the local people who are predominantly farmers and tribal people . The surrounding areas are famous for agriculture, particularly the ‘Chikoo’ cultivation . In spite of the findings of its own committees, the ministry of environment and forests (MoEF) permitted the company, then owned by the Bombay Suburban Electric Supply (BSES) Company Pvt Ltd, to set up a 500 MW thermal power plant. However, the clearance was permitted in the condition that the plant will minimize the pollution level caused by the plant. The Dahanu Taluka Environmental Welfare Association (DTEWA) appealed to the Bombay High Court against the permission granted to set up the plant. But they lost the case in the Bombay High Court. The high court observed that the plant was a necessity for the energy to power Mumbai city. The BSES, however, didn't follow the conditions and set up the plant on 851.23 hectares of wetlands between the Dandi and Savta creek in 1991. After protests by environmentalists, headed by the DTEWA, the environment ministry sent its scientific advisor to look into the matter . After the plant started its full-fledged operation, farmers of the neighboring areas of DTPS claimed that the agricultural productivity of their firm land had significantly dropped. Local farmers claimed that the production had gone down up to as much as 50 per cent. This was confirmed by an environment consultant firm ‘Maya Mahajan’ that between February and March, 2004 revealed a 30-70 per cent decline in the ‘Chikoo’ fruit production. During that period locals had also seen dense fog and black dewdrops on the leaves near the plant . Project Details Dahanu Thermal Power Station (DTPS) started its commercial operations in January 1996. As fuel, the plants use a mix of Indian washed coal and imported coal. The general blending ratio is 80: 20. The indigenous fuel is supplied from SECL (Korba) which is located about 1400 Kilometers from the plant site. Imported coal is received from various countries like Indonesia, South Africa . The plant has a generation capacity of 500 MW and supply power to suburban Mumbai. The company claims that it supply power at the cheapest tariff of Rs 2.45 per unit compared to other power utilities . The plant has got many awards for its distinctive features in terms of performance, technological innovation and sustainability. The plant is the first Power Company to be certified ISO 14001 for its environmental management system & ISO 9001for its quality management System . Why? Explain briefly. Dahanu taluka was notified as an eco-fragile area by a Central Government notification on June 20, 1991. Since the notification, industrial development in this area has been prohibited. However, the power plant was given clearance on June 13, 1990 . The environmentalists filed a comprehensive writ petition in the Supreme Court in 1994. The SC appointed the National Environmental Engineering Research Institute to investigate. Based on the report, the SC directed the setting up of a special authority to oversee the development of Dahanu Taluka . With the lawsuit filed by the activists, in 1999, Dahanu Taluka Environment Protection Authority (DTEPA), appointed by the Supreme Court, had recommended a flue gas desulphurisation (FGD) for the plant Dahanu Parisar Bachao Samiti also made representation to the concerned authorities time to time to shut down the plant and to switch to gas based rather than coal based operation to take care of the Sulphur dioxide emissions. Even with all these protest, the renewal of consent for the plant was granted in 2004 for five years without any public hearing . In June 2005, the Bombay HC lowered the amount of the bank guarantee from Rs300 to Rs100 crore. A deadline of October 2007 was accepted by all as being the final time schedule for the installation of the Flue Gas Desulphurisation (FGD) Plant .